An orchestra audition is not too different from a competition or a college music school audition; all have a group of judges who make a decision about your playing. Is it in tune? Is it played with a beautiful sound? Is it rhythmically steady? Is it musically expressive? Is it good enough to get through to the next round? Preparing for an orchestra audition is a long, but necessary, process. The list of music you will need to prepare can sometimes seem a bit daunting. For the Milwaukee Symphony Orchestra audition, I had to be ready to play the exposition of a major romantic concerto, the exposition of Mozart’s 4th or 5th concerto, one movement from a Bach solo sonata or partita, and 21 different orchestra excerpts! These repertoire lists change from year to year, but you can bet some of the usual suspects will always be on it. In fact, Alex Kerr, one of my teachers at Indiana University, has an “Excerpt Bible” of pieces likely to be on an audition list. My first experience with orchestra auditions was at Indiana University. 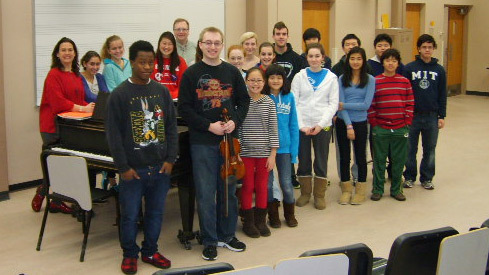 Every year, all the string players audition to get placed in one of five orchestras. This was the first time I had played Strauss’ Don Juan, the Scherzo from Schumann’s 2nd Symphony, the Scherzo from Mendelssohn’s A Midsummer Night’s Dream, and the finale of Mozart’s Symphony #39. It took me a couple years and more than a couple lessons to get these excerpts in decent shape. As it got closer to my Milwaukee Symphony Orchestra audition, I played my excerpts for as many people as I could. Their reactions and advice helped me realize what I could still improve. Also, I found it extremely helpful to have a mock audition at home every day leading up to the audition. Running through 10 excerpts and my concerto without stopping or warming up in between gave me confidence that I could do the same at the actual audition. But this was only possible after many weeks of slow, careful practice! At the preliminary round of the audition, I was number 87. I tried not to think about how the judges had heard 86 Don Juans before mine; all I had to do was play it just as I had in my mock audition. Most judges actually make their decision in the first 5-10 seconds they hear you. First impressions are (almost) everything, so it’s important to make yours a good one. After a solid run-through of my Tchaikovsky concerto exposition and four other excerpts, I was happy to be announced as a semi-finalist. In the semi-finals, my attitude was slightly different than it was during the first round. Instead of just going for a solid run-through, it was time to stand out from the other 10 people. I was able to think that way because I had spent so much time getting my excerpts solid in the previous months. For this round, I tried to really exaggerate the specific character of each excerpt. They asked for solo Bach, and five different excerpts than the first round. When they announced me and one other person as finalists, my heart started racing. We were given 15 minutes to rehearse both the romantic concerto and the Mozart concerto with a pianist. Just playing through both expositions took about 10 minutes, so the plan was to be flexible and responsive in my playing; there wasn’t time to rehearse every detail and transition. The final round consisted of the expositions of both concerti and about 7 more excerpts. After what seemed like an hour of the audition committee deliberating, I was relieved and thrilled to hear that they would love to have me join the MSO in September. I am very grateful to the String Academy of Wisconsin for giving me the opportunity to perform my Tchaikovsky concerto, Mozart concerto, and Bach. Also, I am thankful for the support of David Anderson and Darcy Drexler, as well as everyone who listened to my excerpts. If you have an audition or competition sometime in the near future, I hope my experience will be helpful to you. Practice 150% beforehand, and when the big day comes, go for it!